While heading back from the coral shores of Odo Coast in Itoman, I snapped this picture. It was on a very steep road that runs alongside a golf course. Earlier in the day, we decided to head for the sea. We didn't have any particular place in mind, so we wandered south. While looking for a place to eat lunch in Itoman, we saw a sign advertising food so we followed it. As we approached the place we quickly realized it wasn't a place we wanted to eat at since it was some sort of posh resort or country club with a golf course. (Much too expensive!) But it was on a high hill overlooking the ocean and offered great views. We decided to explore the area a bit and it turned out there was a very narrow road running along side the golf course that headed to the seaside. (This is where the above picture was taken.) At the end of the road, there was a small public parking lot and an etrance to the seashore. It turned out to be an awesome place that is part of Odo Coast. It is mostly a jagged coral covered shore, but when the tide goes out, a whole bunch of tidal pools are formed that you can walk around. In the pools were all sorts of marine life - very colorful fish, sea cucumbers (or something very similar), sea urchins, crabs, etc. We spent about 5 hours exploring the place. I was in the water and was attempting to climb a large rock and noticed this bright blue and black snake swimming near my foot. Fortunately, before heading for Okinawa I had been warned about the various dangerous marine critters in the area and knew immediately to stay away from this. 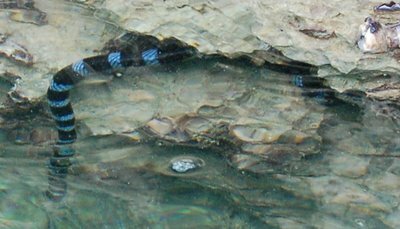 Sea snakes are poisonous. Had I not known about it, I might have thought it was just a very pretty eel. It was interesting to watch as it swam in and out of little holes in the coral outcropping occasionally bringing its head to the surface to get some air. The scarey part about this is the large rock the sea snake was swimming around was an nice spot for climbing and jumping into the water. For a couple hours there were some teenagers hanging out playing in the water at the base of this rock occasionally climbing up it and jumping into the water. And they didn't know there sea snake was there! When I explained to them what I saw (as best I could since they only understood Japanese), and they then saw it for themselves as we pointed at it, they immediately got out of the water. I took a bunch of other pictures of this area - it was quite beautiful. Hopefully I'll have the time to upload them later on today. Nice snake pic, Brian! It pays to do your homework! Remember not to play with the Man-o- war jellyfish! Beautiful pictures,Brian! You'll definately have to give us a slide show when you get back! How many dangerous creatures do you have to look out for? Any big, scary spiders lurking about?